If you’re fortunate enough to live near an arcade, odds are that you’ve played the arcade smash Double Dragon, which was released last year. This has quickly become one of my favorite arcade games, as I love the beat ’em up style of play and the ability to team up with a friend for cooperative fighting. I was thrilled to see Double Dragon get a home release on the NES, but my feelings on the port are mixed. On the one hand this is probably the best game in this genre currently available for the Nintendo, but on the other hand it doesn’t include the co-op mode so adored by fans. Double Dragon stars brothers, Billy and Jimmy Lee. Billy’s girlfriend Marian has been kidnapped by the local street gang, the Black Warriors. Your goal is to use your martial arts skills to defeat the gang members and rescue Marian. There are four stages, two where you fight to the death on the savage streets of a bustling city before embarking into a forest area and eventually descend into the caves below. Eventually you find your way to the Black Warriors’ secret compound where the final encounter takes place. This journey won’t be easy as you only have three lives to get the job done. Watch the health bar though; each enemy punch and kick will knock a section off, bringing you closer to the dreaded Game Over screen. As you make your way through each stage, you’ll be confronted with gang members to fight. They nearly always come in pairs and you defeat them by punching and kicking the crap out of them. Occasionally you can knock weapons like whips, bats, knives, and dynamite out of their hands and use them against your foes. There are five different enemy types to take down, two of which are bosses you’ll later fight that end up just being more difficult bad guys to take down. The final two stages change up the pace a little bit by adding in some platforms to jump on to avoid falling into pits. Other hazards like spikes and rocks also abound, so stay sharp. Double Dragon features a power-up system that is very unique and actually utilizes your points. After every 1,000 points you score, you receive a heart. Each new heart will give you a new attack move. Hair grabs, jump kicks, throws, and spin kicks are some examples of these new special moves. These are critical for the later stages, as simple kicks and punches won’t cut it against multiple Abobos, the toughest common enemy in the game. This sense of progression is a nice addition to the NES game and actually makes earning points worthwhile. 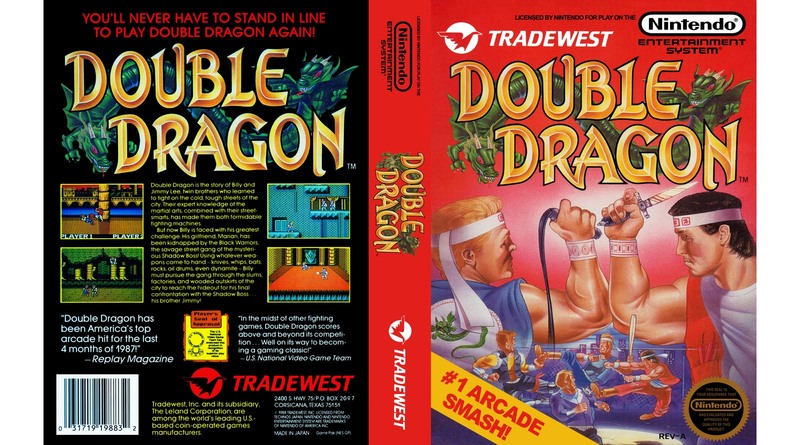 The biggest issue most will have with the NES version of Double Dragon is the omission of a true 2-player mode, as is featured in the arcade. This would be a perfect title to play through with a friend, much like Contra, but instead you are forced to take turns, waiting until player one dies. It’s not uncommon for arcade ports to cut features to fit onto a home console, but if Ikari Warriors and Rush ‘N Attack can pull it off, it seems like a silly concession here. Couple that with the fact that the Sega Master System version of the game (coming this holiday) will feature co-op, this just reeks of a rush job. Of course the graphics also take a hit when compared to its arcade big brother, but that’s par for the course and honestly the NES version looks pretty dang good. Stages and story also differ, but only arcade purists will care. Perhaps to make up for the exclusion of the co-op mode, the developers created an all-new challenge that pits player against player. Here you can each pick up the controller and fight against one another to the death. You can actually choose from a variety of characters and the first one to lose all of his health is the loser. This mode can be fun in the right hands, but the limited moves make this a throwaway bonus that most will probably play once or twice and become bored. Don’t get me wrong, it’s nice that they added something extra to the home version, but it’s just not that fun to keep coming back to. The music in Double Dragon is outstanding and some of the greatest you’ll hear on the Nintendo. The score rivals some of the best, such as Contra, Mega Man, and Wizards & Warriors. The title screen music is so good that I often just sit there listening to it before beginning the game. Stage one and two are especially upbeat and catchy tunes, whereas the later levels take on a more sinister dark tone befitting of a dark forest and underground cavern. If only the game had a few more stages we could have had even more great music to listen to! Graphically the game is very pretty with detailed backgrounds and a pseudo-3D look to the stages. The characters are a lot smaller than the arcade version, but a lot of detail went into the sprites, especially as the move set becomes larger later in the game. With colorful backgrounds and interesting environments, this one looks better than many other NES games released so far this year. If I had not played hours of the arcade version, I would think Double Dragon on the NES was a solid, but rather short game. It’s just very hard to justify leaving out the 2-player mode and that drops the game’s score significantly. The length and difficulty of the game also come into play. Four stages is just too short, especially when you factor in the rising price of Game Paks (up $15 to $20 more than last year’s releases). The first couple of levels of the game are relatively easy, but the difficulty goes up for the last two stages. That being said, with practice the game isn’t overly hard to beat, and I’d expect most players to have seen the ending within a few nights of play. Some places have just begun renting video games, and this is a great candidate as there’s very little replay value to find here. Despite its many shortcomings, I still had a lot of fun playing Double Dragon, and it’s miles ahead of its unofficial prequel, Renegade. The power-up system, as well as the amount of weapons as your disposal, adds some much-needed variety to the combat. The settings and backgrounds are cool, and the music is outstanding. However, the lack of a true multiplayer mode and the length of the game might it hard to justify a purchase.